A little less than two months after Line celebrated reaching the goal of 100 million global users, the popular Japanese mobile messaging platform has achieved yet another noteworthy goal. 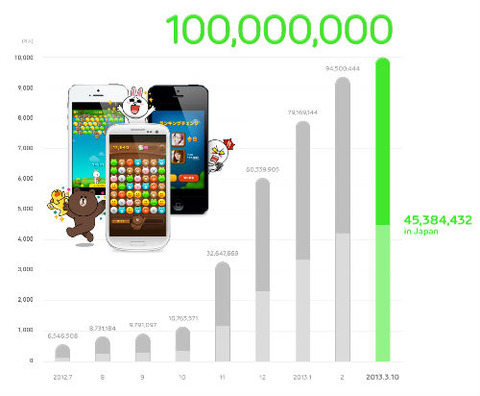 Line's 16 game titles have now been downloaded 100 million times in the past seven months, it was revealed Wednesday. The Line Game service, which was launched in July 2012, lets gamers connect with each other via the Line app. They can play games with each other and share their scores, based on rankings, with their friends. The first game that Line integrated with its the mobile messaging application was called Line Pop. It hit 10 million downloads within 12 days of its release, and 20 million downloads in less than two months. Another of the company's games, Line Bubble, saw over 10 million downloads in 28 days. Other popular games are Line Birzzle, Line IceQpick, and Line Cartoon Wars. Line's biggest market is obviously Japan, where it sees a full 45% of its games downloaded, but the service is also popular in other countries in the Middle East, Eastern Europe and Southeast Asia, including Thailand, Taiwan, China, Hong Kong, Malaysia, Indonesia, Macau, Singapore, Vietnam, Cambodia, Saudi Arabia, Australia, Kyrgyzstan and Algeria. Line is a smartphone app that allows users to make free calls and messages to one another, both nationally and internationally, regardless of which mobile network provider they are using. Users can make free voice calls on iOS, Windows Phone, and Android over 3G, 4G and Wi-Fi. If there is an American equivalent to Line, it would probably be Tango, the all-in-one social networking app, which allows users to text, call, video chat and play games with each other for free. That service also recently reached the 100 million user level. 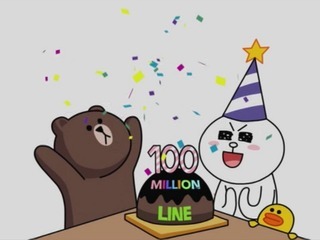 Since being launched in June 2011 by NHN, Line has seen tremendous growth, seeing is usersbase grow by at least 10,000 every two months since its launch, reaching 100 million global users in January. In addition to its messaging app and games, Line has a slew of other features, including instant translation service; Official Accounts, which enable users to interact with famous public figures; Timeline and Home, which allows user to share recent updates with friends; and emoji, or stickers, that customers can purchase and use to communicate with one another as well as personalize their user profiles. Line also offers a camera app, which was downloaded 20 million times and is currently the top camera app in 27 countries around the world. Line has been ranked as the number one free app in 41 countries in the free app category including Japan, Singapore, Hong Kong, Taiwan, Thailand, Malaysia, Macau, Saudi Arabia, Kuwait, Bahrain, United Arab Emirates, Qatar, Jordan, Israel, Switerland, Turkey, Ukraine, Cambodia, Kazakhstan, Russia, Belrus and Latvia. Line made emoji available on the iPhone in December. 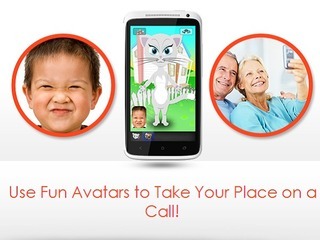 Founded in September 2009, Tango is a free mobile video calling service that connects family and friends wherever they are. Tango offers high-quality video calling for iOS and Android devices and works over 3G, 4G, and Wi-Fi. More than 10 million people in 190 countries are using Tango to communicate every day, stay connected, and share special moments as they happen. Download the Tango application for free in the App Store and Android Market. Tango is based in Palo Alto, California.